Many students end up taking out expensive private loans even though there are cheaper options available to them. The first in her family to go to college, Alicia Aiello wanted more than anything to study at Syracuse University. But tuition was expensive, her parents couldn't help much with the then-$46,000-plus in tuition and expenses, and she didn't get enough financial aid to bridge the gap. So during her first semester, Aiello found herself taking out an $18,000 bank loan, on which she'd owe $6,000 worth of interest before she paid back even a penny of it. "[W]hen I found out someone would give me $18,000 without a co-signer, I was really excited -- until later down the line, when I found out how much I was going to owe," Aiello says. "That was probably the biggest mistake I ever made." Many students are making mistakes like this. America's student debt crisis is not only being fueled by skyrocketing tuition and a weak job market, but also by students' ignorance about financial matters in a system that makes it surprisingly easy for them to attain a loan. In many cases, students barely understand the obligations they're assuming. "A lot of us don't have parents who went to college or who understand anything about this process," Aiello says. "I have a lot of friends who just signed those loans without any idea what was going on." American university and college students graduated with an average of $26,600 of combined government-subsidized and private loan debt in 2011, according to figures released this month by the nonprofit Institute for College Access and Success' Project on Student Debt. More than 9% of new graduates default within two years, and 13.4% within three, the U.S. Department of Education reported last month. Feeding this rising sea of red ink are loans from private lenders like banks, which typically charge more than federally-guaranteed loans administered by financial aid offices. 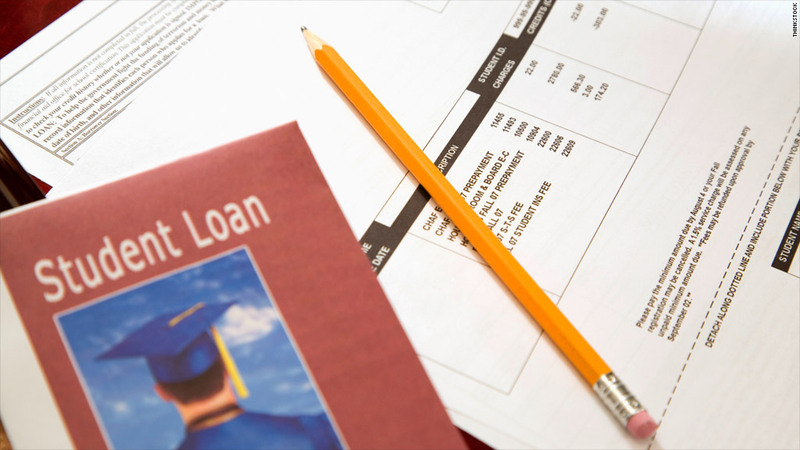 While federal loans have fixed interest rates and flexible repayment terms, private student loans carry variable interest rates that are usually higher, and while they sometimes are given without any co-signer, they often require parents or others to become responsible if the loan is not repaid. A report this month by the government's Consumer Financial Protection Bureau found that private loans now account for $150 billion of total student debt, and at least $8 billion worth of these are in default. The agency said students who have borrowed from private lenders complain not only about confusing terms, rates, marketing, and sales tactics, but also about difficulties negotiating repayment plans or refinancing. A lot of this could be avoided. More than one in every five dollars of student loans comes from private lenders. Yet, like Alicia Aiello, at least half of undergraduates who take out private loans have yet to max out their eligibility for -- and could still easily get -- cheaper federal loans, according to the Institute for College Access and Success. Financial aid officers say the best deterrent to this mounting debt is information. But students appear to be getting very little of that, especially since budget cuts are thinning the ranks of already overworked financial aid employees. "There are many financial aid officers who agree that there should be one-on-one counseling to explain to students how much they'll owe, but most of them simply don't have the staffs," says Thomas Brock, director of post-secondary education at MDRC, a nonprofit research center created by the Ford Foundation. Jason Deitz, assistant director of student financial planning at Alvernia University said his office only has five people serving nearly 4,000 students. A study by the Project on Student Debt found that some college and university financial aid departments don't publicize their office hours or contact information, use technical language students don't understand, provide English-only materials while serving a growing number of non-native English speakers, are open only during the days when increasing numbers of students take night classes, and put their least experienced employees on the front lines to try to answer student questions. "You hear people talking about this issue, but what are they doing about it? How are we educating our students to know how to borrow smart, and doing what we can to reduce the loan debt?" asks Deitz. Some colleges and universities are starting to address the problem by requiring students to undergo financial literacy training. Last month, the State University of New York system announced the first statewide plan to curb student loan defaults, opening loan servicing centers on every campus to help students better understand the debt they're getting into, and by reaching out to students considered at high risk for default. (Read more about efforts by colleges and universities to tackle student loan debt). And while technology has helped ease the burden on financial aid departments, it has done more harm than good for students. Students apply for loans on the same form they apply for grants, which can downplay the high stakes of borrowing. There are also only minimal federal requirements that students receive live, in-person financial counseling. They can simply read the terms of the loan online, which is where they also sign the master promissory note. Overall, the process takes about 20 minutes, says Cynthia Grunden, associate vice chancellor of student financial services at City Colleges of Chicago. "Students will go through the [online] entrance counseling and they'll fly through it and try to get it done as quickly as possible," says Deitz. "They're not reading the fine print. And then they'll end up saying, 'I owe what? I have to pay how much?'" Aiello learned the answer to that question the hard way. She has graduated now, and is working as an assistant video editor at a marketing company in Philadelphia. Good thing, too; her college loan repayments come to more than $400 a month, including $195 for just that one private loan she took out as a freshman. "I really want get started hacking away at that," she says. "It's riding on my back."